An exclusive interview with the Serbian president by Alexander Dugin. The US Vice President Joseph Biden’s visit to Serbia concluded. Closed-door talks with Serbian President Tomislav Nikolić, as expected, featured harsh pressure on the Serbian leadership on the Kosovo issue. 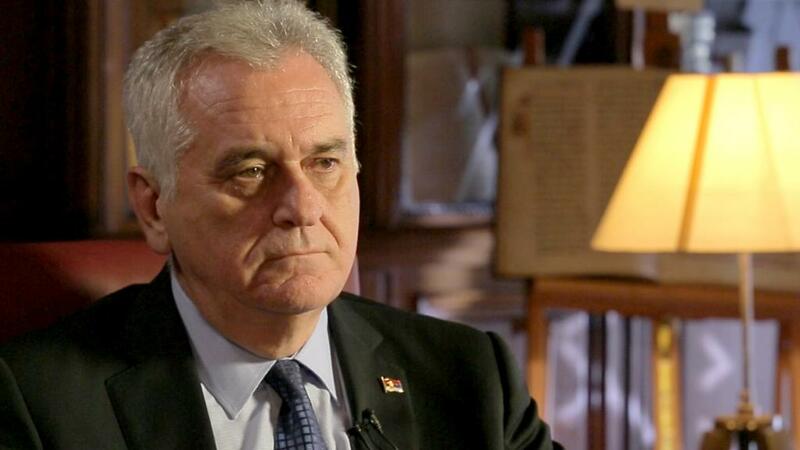 However, at the end of the meeting, Nikolić said that he would never sign an agreement with Pristina even if that meant not being able to join the EU. He also stated that Serbia would never impose sanctions against Russia even if EU policies demanded such. Katehon presents its readers with the following, exclusive interview with Serbian President Tomislav Nikolić by Tsargrad TV channel’s editor-in-chief and Katehon Analytical Center’s Supervisory Board member Alexander Dugin. Alexander Dugin (A. D.): Mr. President, first of all, thank you for kindly agreeing to give an interview to Tsargrad TV channel. I would like to know: how do you see the state of Russian-Serbian relations today? Of course, we cooperate with other countries, but no one can interfere in our bilateral relations. And there is the enormous service and unique merit of the President of the Russian Federation that is understanding the true meaning of small Serbia. Powers with populations of a hundred million or a billion might regard Serbia as a small state. But in terms of friendship, which cannot be measured, Serbia is great to all of its friends and those who are worthy of its friendship. Today, we have established excellent political relations, mutual cooperation, and achieved unity in crucial areas. We managed to gain Russia's support in several situations that were critically important for the future of Serbia. These include the resolution on Srebrenica which proposed to prosecute the Serbian Republic for genocide, and the vote at the UNESCO General Conference on inducting Kosovo into UNESCO, which would have given all Serbian monasteries, all of Serbia’s cultural heritage in Kosovo and Metohija, over to the so-called state of Kosovo. We have agreements with Russia on joint participation in all matters affecting the fate of our countries. This is invaluable for Serbia. Russia opened its huge market up to Serbia and removed customs duties on almost everything, except for a small group of products. This is a huge source of raw materials and energy for Serbia. Unfortunately, we cannot move forward with the South Stream project, but ... Never say “never”. I always hope that the EU, and especially Bulgaria, will have the wisdom for us to build the South Stream and provide Russian gas to a great part of Europe. Now, we are confronted by the fact that there is our great friend Russia, and the European Union, to which we aspire to join and are surrounded by, and whose member we would like to become if they will accept us without humiliation, but with dignity. Russia and the European Union are now in a dispute in which it is very difficult to determine our place. But if you see that Serbia did not join the sanctions against Russia, then this is a sign as to whose side we have taken in this dispute. We have learned from our history in this regard. We were under sanctions too long to join them now. After all, sanctions are not really against politicians, but against a regime. Perhaps they want to overthrow a regime against which sanctions are imposed, but it is the population that actually suffers - the weakest, the poorest, and children. Those of us politicians in Serbia whom the West associated with Russia were under sanctions. We were not allowed to go to the West or obtain visas. This didn’t spoil my life. On the contrary, I was even proud of being sanctioned. But I’ve seen people who suffered from these sanctions - how they suffered from economic difficulties and received less from the state than they needed. First and foremost, social assistance and child allowances. The sanctions affected innocent people. If there is anyone wise in the West, then they should speak out and say that sanctions will not bring anything good from the Russian Federation, and will bring nothing to the European Union. Without the exchange of goods, capital, and people, everyone suffers. Then all that’s left is to close each other off into ghettos. And it is small countries in the European Union that suffer the most from these sanctions as their markets are flooded with products from the main countries that receive more subsidies, and therefore are cheaper than the small countries’ goods. That’s why we will never join the sanctions against the Russian Federation, and I do not think that this is a common foreign policy. The EU has no common foreign policy. The example of Kosovo and Metohija shows this more clearly. If the common foreign policy is that all countries recognize the independence of Kosovo and Metohija, then what about the five EU member states who do not recognize it. Why haven’t sanctions been imposed on them? They cannot force a country to act against its own interests. They approach us not out of some kind of special friendship, but because they are afraid of the Kosovo precedent begin repeated among themselves. Therefore, just as they can be part of the EU and recognize the independence of Kosovo, so can Serbia join the EU without recognizing its independence. This is the only condition which Serbia cannot fulfill and does not want to fulfill. Neither history nor the future of Serbia’s children allow it. Serbia will not betray something for which millions of Serbs gave their lives just for some carrots, some life improvements, or some administrative and economic reforms. Serbia would humiliate itself by imposing sanctions against another country only because someone else imposed them, or if it recognized the independence of Kosovo and Metohija only because stronger, larger, and more powerful countries recognized it and are pressuring others to do so. A. D.: Tsargrad TV channel and the Basil the Great Foundation brought the Holy Fire to Serbia twice already. You met them and participated in the Easter service. What would you like to wish our audience, our channel, and are you waiting for the Holy Fire to arrive in Serbia a third time? T.N. : I would like to answer your last question. Having established one tradition, especially in the Church, we cannot abandon it. So if it happened twice, then let it happen 202 times. As long as my health allows me, I will always wait to greet the Holy Fire, regardless of my position. Because I know what I am meeting. It is not because of the camera. The point is a miracle in which we Orthodox participate in a special way and which I believe in because a man is incomplete without faith. As for your work here and the success you achieve, everything depends on you. All doors are open for you here. Our people very much respect and many love Russia as a country from whom we can always expect only good, as a country which has never done us any harm. Russian romances are still requested in kafanas. To this day, Russian classics are still the most widely read. Perhaps the only foreign authors that most Serbian families read are the Russian classics. Every citizen of Serbia and every single Serb know at least one thing that unites us, and very few can claim something that doesn’t connect us. The way is open for you, and an ideology according to which we are brothers and close to each other will find fertile soil here and be well received by the citizens of Serbia. Our people really are for cooperation with Russia and, of course, they are not against living well with everyone else. Our attitude towards others depends on how others treat us. This avalanche of Western media that has captured this part of Europe is being met with the arrival of media from the East, which is a noble cause. It is always necessary to listen to both sides. Therefore, I wish you success, and if you ever need an opinion or position on current events or events in our common history, just say the word!